Time and again – not least in the recent Republican presidential primary election – we hear of the countless ways money has infested and debased our political system. And in countless community conversations held by the Center for Michigan, we heard from citizens who want reform, of the rules on campaign contributions, on lobbying and on financial disclosure. In short, citizens are calling for an end of “pay to play” politics. 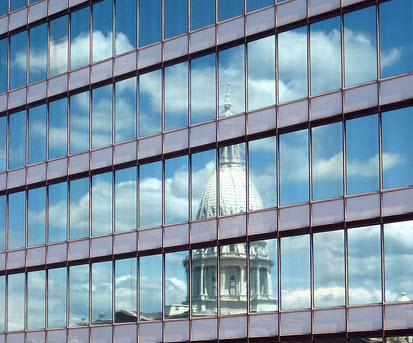 Founded to advance centrist, common sense, effective solutions to Michigan’s public challenges, the Center for Michigan sees no reason why the work of reform can’t begin in 2012 with five specific actions. * Revoke the exemption for legislators from the Standards of Conduct for Public Officers and Employees Act. This law essentially bars gifts to the state's civil servants and executive branch leaders, but it has never covered the legislative branch. Why? What public good is served by allowing the people's representatives to accept gifts and food and drinks from lobbyists? While Michigan legislators absorbed a 10 percent compensation cut at the start of 2011, they are still paid a base salary of $71,685 per year, and an additional $10,800 for expenses. Only legislators in California ($95,290.56) and Pennsylvania($79,613) receive higher annual salaries. In short, legislators can afford their own lunches. * Adopt a financial disclosure requirement for state elected officials, such as the governor, attorney general, secretary of state, Supreme Court justices and legislators. Michigan is one of only three states nationwide not to have this common-sense measure, which allows citizens to confirm with their own eyes that their representatives do not possess financial conflicts with their public duties. Lack of financial disclosure breeds suspicion among citizens that hurts ethical elected officials and, at the same time, keeps nasty stuff in the dark. * Close the loophole in the Lobby Act of 1978 that allows lobbyists to pay for food, drink and travel for legislators. Despite what the Lobby Act currently says, any reasonable citizen would define a free meal as a gift. Lobbyists should not be able to give public officials gifts -- and public officials shouldn't be able to accept them. In the days of Skype, teleconferences and the Internet, the need to travel to distant locales to see "how others do it" is small, at best. And if it truly is for "the public business," such travel is best financed -- and reported -- by the state anyway. * Adopt a real-time reporting requirement for all campaign contributions to candidate, party caucus and political action committees. As the watchdog Michigan Campaign Finance Network recently reported, Michiganpoliticians just this month filed their first campaign contribution reports for the past year. With the aid of computer software, there's little reason that candidates for state offices can't report every contribution the very moment it happens. Our lax reporting requirements do nothing more than encourage “pay to play” political misbehavior. * Cut the nonsense that exempts “independent issue ad” spending from reporting and require the groups behind such ads to disclose contributors behind such advertising. The Brennan Center for Justice says 21 states have rules in place on disclosure on such ads.Michiganshould want this system, which still allows citizens to spend for or against candidates, but in a transparent way. Michigan's current array of laws and regulations does not promote transparency, but does promote a "pay to play" culture in Lansing built on free meals, gifts and travel. It's time to raise the bar. Editor's note: The Center for Michigan, Bridge Magazine's parent organization, is registered as a lobbyist with the state of Michigan. but does not lobby on individual bills before the Legislature. CFM lobbying expenses reflected in this state report consist of a retainer for a multi-client lobbying firm that helps coordinate educational meetings with lawmakers of both parties on such topics as the Bipartisan Caucus, early childhood funding, corrections spending (via the Corrections Reform Coalition) and the Center's public engagement campaign. The Center has not made contributions to political candidates or parties. Very admirable suggestions, but, I guffawed as I read them. What politician in this age of extreme largess in political financing would be stupid enough to curtail it? Certainly not the Repugs, because their tenuous hold on power is totally dependent on new corporate mountains of cash. The only way it will be reformed is if citizens, along with some self-sacrificing Dem politicians, demand and petition for ballot initiatives to force politicians to comply. The Repugs and their corporate masters will fight it to the death. These pragmatic guidelines for elected public servants deserve the CO-SPONSORSHIP of a majority of both houses in the Michigan legislature. Raise the bar and the public's opinion of and support for its legislators will increase - and justifiably so. On behalf of citizens, therefore, I ask that a bill be drafted to accomplish these five sensible rules -- and that the leadership of each party both sign on personally and ask all in service under them to join as co-sponsors. Please and Thank You. This column should be required reading for every legislator. I encourage The Bridge to send a copy to each of them, then keep track of whether a bill results and which of them sponsor, co-sponsor, introduce, or vote yes on it. If The Bridge can't send a copy, I encourage its readers to do so (I'm going to) and The Bridge can keep us informed on progress. OK Phil, let's work up a pledge and a sign up sheet. I'll be glad to go first, and if doesn't happen before, I'll introduce the bills in 2013 when I take office. I hear and read about how bad our system is and how it should be changed, but I do not read a direct link to specific examples of how it has made the system fail, how the old system (less money being spent) had any less problems or any better results. I hear nothing about what the fiancing changes would impact the political system or how it would improve our educations system, how it would change the current economic difficulties, how it would improve the morals, the behaviors, the financial or physical health of our ciitizens. Is this whole ranting and raving over our campaing finance system more about the wants of those complaining and less about how it would improve the effectiveness of our legilators, the lives of our citizens. I am a believer in the value of change, but not when it is only for changes sake and not for a specific impact our the system. Do those wanting change truly believe that the system they want would have prevented two recent governors of Illinois breaking the law and ending up in prison. Or is it simply they want to know who to selectively intimidate and publicly attack. Isn't that what has happened in Oregon in recent year, by knowing who was supporting an issue those opposed to their view were taking public actions against the supports while the media stayed quiet on the supportors on the opposite side of the issue. What are the changes suppose to improve and are those who are so strong for the changes willing to state the impact and are they willing have the changes repealled if the desired impact is not achieved. I strongly doubt it, they only accountablility they talk about is that of others, those politicians whose political stance the disagree with. When have we ever heard one of the people speaking out on this issue will to put their ideas to a real test of proving the merits of what they so strongly believe in?